Now you can turn any wall into a writeable and erasable surface with new Write-On Paint® from Rust-Oleum, notes a write-up from the US-based company. 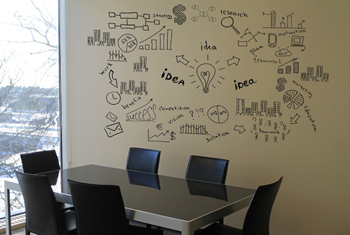 Write-On Paint is clear so it can be used over any painted surface for a customized writable wall. The product features patented burst-pouch technology for no-mess mixing. Simply roll the pouch until the internal seal bursts, shake the contents to mix, pour into paint tray and apply by roller. Rust-Oleum Write-On Paint dries in 4 to 8 hours and is ready for use in three days. It’s compatible with standard dry erase markers and cleaners. The low odor formula makes it perfect for use in offices, conference rooms, schools and more. It can be used on drywall, wood, cement, hardboard, and metal substrates. For unpainted surfaces, prime first. The product is available in two sizes; a 16 ounce kit that covers 50 square feet, and a 24 ounce kit that covers 100 square feet.